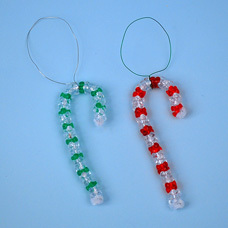 Create interlocking Tri-Bead ornaments in candy cane or wreath shapes. To create candy cane ornament, form a small knot at the end of a white Fuzzy Stick. This will stop the Tri-Beads from slipping off when threaded. Thread crystal and red Tri-Beads onto a white Fuzzy Stick. Once you have reached your desired length, bend and form a small knot against the last Tri-Bead as you did in Step 2. Next, trim off the excess Fuzzy Stick. Shape Fuzzy Stick into a candy cane shape. 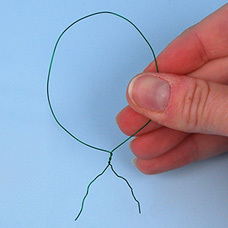 Create an ornament hanger by using Beading Wire. Attach the hanger to candy cane ornament. 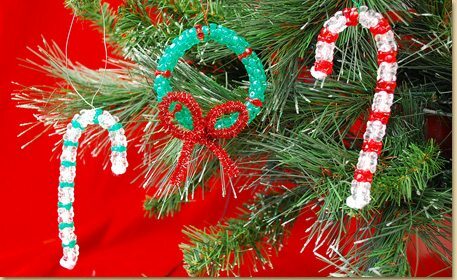 You can also create this candy cane ornament using other holiday colors, such as a green and crystal! To create wreath ornament, begin threading several green and then (2) red Tri-Bead onto a green Fuzzy Stick. Once you have reached your desired length, curl Fuzzy Stick to form circle wreath shape. Trim any access Fuzzy Stick material with scissors. Twist one red Glitter Stick around wreath shape. Form bow shape with red Glitter Stick. Trim excess Fuzzy Stick material with scissors. Tie a piece of craft wire to top of wreath ornament and hang on your tree with your candy cane ornaments!